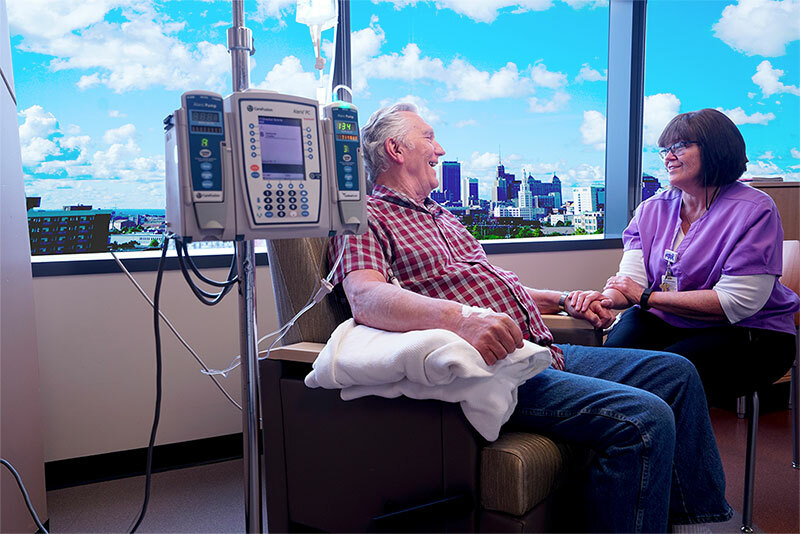 Roswell Park’s Chemotherapy & Infusion Center was planned and designed with input from our patients and their families which allows us to care for you efficiently, while offering increased privacy and comfort options. The Chemotherapy & Infusion Center is open 7 days a week. We take appointments from 7 a.m. to 5 p.m. on weekdays; 7 a.m. to 3 p.m. on weekends. Check in at the Registration area on the 4th Floor of the Scott Bieler Clinical Sciences Center, at the corner of Carlton and Michigan Streets, adjacent to the Roswell Park Hospital. Before your treatment begins, please allow us to show you around the Center and answer any questions. Park in our safe and convenient parking garage directly across the street. During office hours – Please call 716-845-8954 to schedule an appointment or speak to a nurse. After hours – Call 716-845-8901 and give your Roswell Park Physician’s name and your call will be directed to the appropriate medical personnel. National Recognition. Roswell Park is a National Cancer Institute-designated Comprehensive Cancer Center, the only one in the state outside of New York City. Comprehensive Supportive Services including physical and occupational therapy, lymphedema care, pain management, counseling, social work and pastoral care to address physical, emotional and spiritual symptoms associated with cancer. On-site Phlebotomy and Pharmacy within the center ensures expedient lab results and drug delivery. Nursing Expertise of our staff who have special training in administering chemotherapy and other treatments.